By Tirso Nieva Paglicawan, Jr.
A global non – governmental organization with sterling and vast track records of helping search and rescue distressed overseas Filipino workers (OFWs) and a government agency mandated to regulate employment and deployment of Filipinos in the overseas have joined hands and signed a memorandum of understanding (MOU) to provide a convenient, affordable, accessible and swift means to monitor, check and safeguard Filipino workers right at the jobsite abroad especially the gender – sensitive and most vulnerable sector, the Household Service Workers (HSW) without cost to the Philippine government. The launch was held right at the lobby of POEA in Mandaluyong City which was attended by OFWs and family members, foreign countries employment industry’s personalities and even legendary whistleblower Jun Lozada was there present and among the audience. Secretary Jesus G. Dureza and Undersecretary Astravel Pimentel Naic of Commission on Filipinos Overseas, the signing of MOU was led by AKO OFW Inc. International President Marcia Vicenta Paz “Mars Gonz” Gonzales – Sadicon and POEA Administrator Bernardo P. Olalia. As announced by Sadicon during the program, this mechanism is one sure step towards monitoring the level of care afforded to the OFWs, especially domestic helpers at the jobsites in the overseas. Further, she stated that “Bantay OFW Mobile App” shall only serve as medium of communication and cannot be a tool in imposing administrative sanctions. Meanwhile, in his talk, Olalia declared his gratitude and support to the initiative of AKO OFW Inc., other non – governmental organizations and stakeholders with the same genuine concerns for OFWs. On the otherhand, Dureza was all praise to the Filipino workers abroad as he made mention during his casual speech to the audience the immense contributions of OFW sector to sustain country’s economy afloat. He emphasized the great role the individual OFW is performing in every household of foreign employers which had hugely influenced children of these foreign nationals. 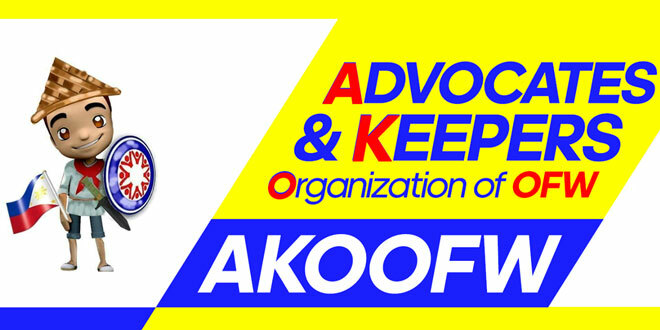 The “Bantay OFW Mobile App” as conceptualized by AKO OFW Inc. founder and incumbent chairman Celerino “Dok Chie” L. Umandap, vice chairman lawyer Marlon P. Valderama and Sadicon shall serve as avenue for convenient communications relative to the living and working conditions and or significant occurrences affecting OFWs. It shall aid the government in monitoring the status and plight of OFWs and the consequential actions undertaken by the concerned Philippine Recruitment Agency (PRA), Foreign Recruitment Agency (FRA) and employer. It also shall underscore civil, friendly and receptive responses to all and users will at the same time maintaining privacy of communication; It shall as well maintain a status of utmost impartiality and shall interact only on what has been factually received and gathered; It shall at all times adhere to its role as conveyor of the status and conditions of OFWs as uploaded, received and gathered for concomitant actions of recipients; and it cannot be used as basis for administrative sanction against concerned OFWs, PRAs, FRAs and employers since it would otherwise discourage their open participation to this system. The “Filipino Migrants’ Day” is being celebrated in honor of millions of Filipinos working overseas. Of a total current population of 92.2 million in the country, there are approximately ten (10) million OFWs around the world in 170 countries with 1 million in the Kingdom of Saudi Arabia alone, followed by Japan, Hong Kong, the United Arab Emirates and Taiwan. Former president Fidel Ramos issued then an executive order which declared June 7 of every year as the date for the national celebration. RA 8042 establishes promotion of overseas employment as a policy while it holds the government responsible for the protection of OFWs. “Distance is not a hindrance for Dok Chie Umandap to extend help, direction and guidance as if he is here physically around; he is my ever dependable partner through thick and thin in our advocacy for the benefits, interest, protection, rights, security and general welfare of OFWs and their families,” were Sadicon’s parting words.